Dishonored 2 gives you something that other stealth action games like Deus Ex and Thief don't: bona fide superpowers that can bend reality to your whim. Whether you choose to slink through Karnaca as Emily Kaldwin or Corvo Attano, you'll have access to a unique subset of supernatural abilities that can totally shape what you're capable of, and all the crafty ways you can dispose of, incapacitate, or bypass your enemies. But you don't get access to all those powers right away, because you need to unlock them with Runes you find scattered throughout the environments. And because there are only so many Runes lying around (and not all of them are easy to find), you need to start planning early which powers you want in your repertoire. This guide is here to help you with that process. Having played as both Emily and Corvo, I've narrowed down which powers you'll want to prioritize, and how they'll enhance your preferred playstyle. Dishonored 2 is a game that bears replaying to see all the permutations of the ways your choices affect the world, so you'll probably end up doing some power experimentation of your own. But for your first time through, these space-and-time-warping skills are practically essential. Agility: Getting a higher vantage point is always advantageous, whether you plan on knocking out a room full of guards, or getting the throat-slicing jump on a high-priority target to kick off a murderous ruckus. With the increase jump height of Agility, you'll find it much, much easier to traverse the very vertical level layouts, letting you vault up to rooftops that were once out of reach. Sure, you could use Blink/Far Reach to access most heights, but being able to sneakily hop up to a ledge - instead of clumsily missing it and falling into a surprised NPC - smooths out your exploration and your preparedness all in one. The extra oomph of a double jump also makes it much easier to land on your targets with pinpoint precision for a quick kill/knockout. Bonecharm Crafting: This is the ultimate in delayed gratification. Skilling up Bonecraft Charming is an excellent way to further tune your playstyle, and Trait Synergy turns the incremental buffs of Bonecharms into significant advantages once you start stacking your favorite effects. And though it's very costly to access, acquiring Craft Runes is your best chance at expanding your suite of powers beyond the normal limits, as you'll be able to convert your Bonecharms into Runes that open up even more powers. Skilling up Trait Synergy also removes the need to unlock additional Bonecharm slots until later, as you can effectively jam two Bonecharms into one to save on space. You might feel a little less powerful early on, but Bonecharm Crafting is a long-term investment that's essential for mastering more powers and upgrades later on. Shadow Kill: If you've no qualms with snuffing out your enemies, but still want to err on the side of stealth, Shadow Kill will save you a lot of time and level-wide alerts. Corpses will turn to ash once you've slain an unaware target, so you don't have to lug their body to a hiding spot lest passersby see the remains of your murderous work. This can still be useful on a Low Chaos run: killing a handful of guards along the way doesn't immediately send Karnaca into turmoil, even if it does weigh somewhat on your conscience. Be aware that the two upgrades to this Power - which turn all kills into ash, or turn bodies into bloodfly swarms - aren't very conducive to stealth, so sneaky assassins should be fine with just the base power. Shadow Walk: This is the shapeshifting ability made famous by Dishonored 2's reveal trailer: Emily morphs into a crawling creature of pure shadow, creeping along the ground and staying mostly hidden unless you start running circles around guard's feet in well-lit rooms. When fully upgraded with Shadow Run and Enhanced Shadow Attack, this power can turn you into an absolute killing machine, as you're invincible during all the grisly execution animations. And if you prefer the non-lethal approach, Shadow Walk is still great for slipping by large groups of enemies, then sucking the memories out of whichever poor sap gets isolated from the group. Domino: Shadow Walk may be the most showy, but Domino feels like Emily's true signature ability. Linking up your targets to either die or zonk out in unison is simple, even with Domino's relatively short range; just find a high perch, peer down on your adversaries, and start planning all the devious tricks you can get up to with Domino. If you're feeling particularly feisty, try creating a Domino link from an enemy to a mirror image Doppelganger, then executing yourself to score the kill. Or, link a room of enemies together, shoot one with a Sleep Dart, then loot all their bodies before they hit the ground snoring. Lasting Possession: Possession is amazing for stealthy, Ghost-style playthroughs where you aim to pass through completely undetected. Because you become an astral projection when occupying your host's body, there's no danger of someone suddenly finding your physical form huddled in a corner during a Possession - and if you unlock Corpse Possession, the number of potential hiding places in the levels significantly increases. If you're really looking for a challenge, Lasting Possession is essential for scoring the impressive Circle of Life Trophy/Achievement, where you bounce your Possessions between a person, hound, rat, fish, and bloodfly all within a single activation. Good luck finding the perfect setting and sequence to pull that off. Stop Time: Here's the literal showstopper: Corvo's signature power to bend - or in this case, freeze - time, letting you set up all kinds of mystical shenanigans. Throw a unconscious body off a ledge, freeze time, then catch him at ground level just for fun! Wait until someone fires a gun at you, stop time, then plunk the ammunition right out of the air (or Possess their body and move it into the path of their own bullet)! It also allows you to simply sneak past entire armies with ease, and the ability to spool time forward bit by bit can create some great moments of hilarity, as surprised guards of citizens react to your presence in shock with their low, slow-mo voices. In terms of sheer creative potential for outlandish assassinations or eliminations, nothing tops Stop Time. If you just want to watch the world - or at least your empire - burn, and you're fine with killing anyone and everyone in sight, these powers will serve you well. But if you're attempting any kind of stealth and/or pacifist playthrough, it'd probably be best to pass on the following powers and save your runes for something more useful. Reflexes (Enhancements): Reflexes, and all the upgrades it entails, can make or break your survivability in combat, especially on harder difficulties. 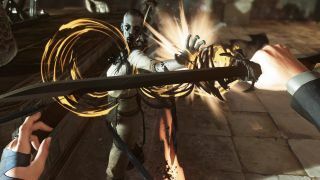 The ability to parry incoming attacks is essential when you're going up against a group of enemies, as you'll quickly find that slashing wildly is only effective if you've already got the jump on someone. Skilling into Superior Deflect is crucial for deflecting incoming gunfire and bolts, and the fact that you can use these deflections to kill enemies who are up close is a huge boon in large-scale skirmishes. But perhaps the most important of all is Adept Parry, which widens the timing window for parries and should hopefully give you a 100% success rate on your parries in the process. That easier input is a godsend when you're frantically trying to block incoming attacks in the heat of battle, and is sure to save your life on multiple occasions. Doppelganger (Emily): It's undoubtedly cool to be able to conjure a mirror image of yourself, though in practice, your Doppelganger can be a bit unwieldy. If you want to turn Emily into a one woman army, you'll want the Twin Shades and Deadly Shade upgrades, which will let you spawn two clones that can fight and even kill your enemies. But for stealth purposes, the confusion that Doppelgangers cause among enemy ranks can just as easily be replicated by a Howling Bolt and a quick Far Reach leap to a high vantage point. Windblast (Corvo): Force Push, Sonic Boom, whatever you want to call it - Windblast is the best way to make an explosive entrance into an all-out massacre, because it serves almost zero purpose for stealth runs. Windblast can be used to send unsuspecting targets sailing over the ledge of a tall building, or even the odds in a gang-on-one fight if you ever get surrounded. That's a scenario you'll need to get used to, because using Windblast is a surefire way to alert everyone in the level that there's a huge fight going down against a masked intruder, and your enemies will come for you in droves.